Roccat, a German gaming peripheral provider, has been engineering gaming products since 2007. Some of their more recent products feature AIMO “Living Light” technology, which reacts to your usage style. It also becomes more dynamic with more AIMO products you introduce into a computing set-up. However, the latest AIMO-ready addition by Roccat is so much more than just another fancy lighting gaming peripheral. 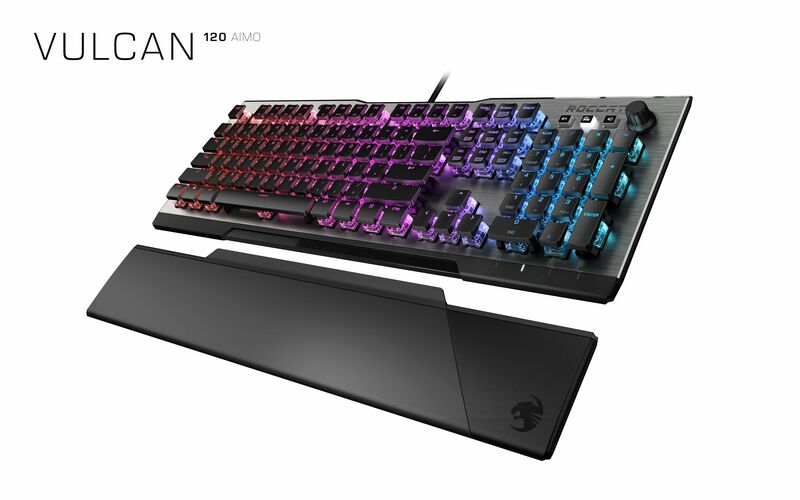 The Roccat Vulcan 120 AIMO keyboard, winner of the iF Design Award 2019, features Roccat’s own Titan switches and an aluminum plate. Let’s take a deeper look at the Roccat Vulcan 120 AIMO keyboard. The Vulcan 120 AIMO weighs in at 1150g, features a full QWERTY keyboard layout, includes media keys complete with volume dial, and comes with a magnetic detachable palm rest. Each individual key is customizable in both function and illumination, with up to 16.8 million color options to choose from. It also has an anodized aluminum plate as the top of the keyboard’s frame and threaded cabling to avoid wire snags with your other connected PC peripherals. What you get at face value with the Vulcan 120 AIMO is a very solid and sturdy keyboard while also being one of the more attractive keyboards I have seen in a while. The top aluminum plate coupled with the dust resistant casing of the Titan switches promotes some top-notch protection against wear and tear. Roccat’s Titan switches feature a 3.6mm travel distance with a 1.8mm actuation point, resembling something close to brown switches. The Titan switch has the feel of a linear switch, similar to what I experienced with the Razer Huntsman Elite. You have nice stable key strokes regardless of the angle or vigor in which you press each key. This is thanks to the Titan Switch’s transparent housing around each key, displaying beautiful LED lighting while focusing on key-press stability. Whether it was typing or gaming, using the Vulcan 120 AIMO felt comfortable, reactive, and precise throughout. I found myself becoming quite fond of the look of the illuminated Titan switches against that aluminum top plate. Each key not only illuminates at the top, but also through the transparent housing of each switch. Here, Roccat was able to give you a brilliant light show that shines quite brightly at its highest setting. Of course, as with most of the mid to high end gaming keyboards out there nowadays, you can control how bright you want these lights to shine. One of the more interesting bullet points Roccat put out there about their Titan switch is regards to their “silent” switches. Make no mistake. This is a mechanical keyboard and you absolutely hear your key strokes. So chose to vet the Roccat Vulcan 120 AIMO’s key strokes against that of the Razer Huntsman Elite and the Logitech G512 Carbon, from previous keyboard reviews. Sure enough, in comparison, the Roccat Vulcan 120 AIMO’s key strokes were indeed noticeably quieter as I was not hearing the higher pitched clicks that were present in the other two keyboards. The bulk of the Vulcan 120 AIMO’s functionality comes via Roccat’s very own peripheral customization engine, the Roccat Swarm. 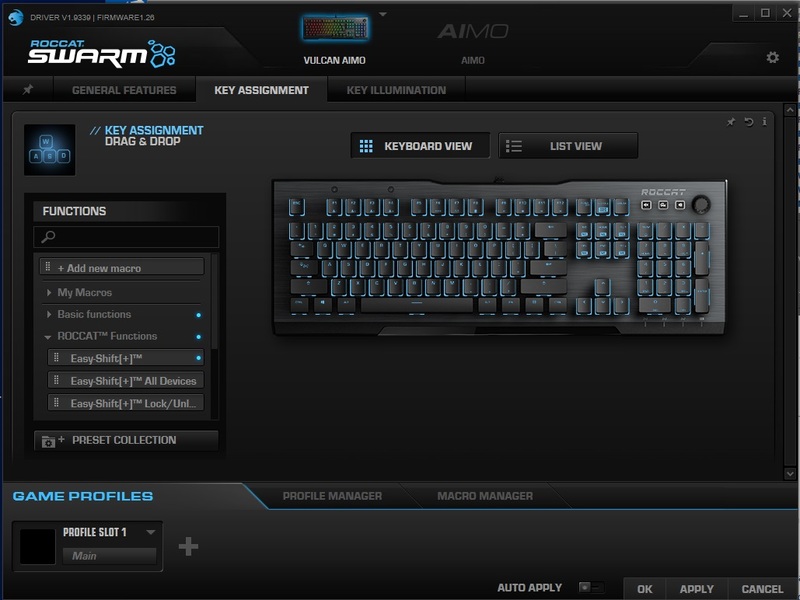 The Roccat Swarm is a free software download that opens up more keyboard functions such lighting customization, macro creation, key behavior tweaks, and custom profile saves. Like with other gaming peripheral software, you can also setup customization profiles that automatically trigger when you run games or applications that you specify. The Macro Manager also is pretty par for the course, where you can create macros by recording your key strokes, then doubling back to tweak key-press durations and delays as needed. I found the Roccat Swarm to be fairly straightforward and easy-to-use. Under Key Illumination, you can highlight multiple keys and assign colors and illumination behaviors quickly and easily. Macro Manager comes populated with all sorts of pre-loaded macros, which I thought was pretty handy to have. When it comes to newer PC gamers, not everyone comes mentally equipped to create their own macros from scratch. So having some examples already loaded in the software could go a long way to helping new users understand how to create or tweak them. Once you create your macros or other key assignments, it is as simple as drag and dropping the functionality onto the keys of your choice to assign them. As impressed as I was with the Vulcan 120 AIMO keyboard and the supplementary Roccat Swarm software, the AIMO functionality had me scratching my head a bit. On the surface, it appears that the AIMO function works better, or at its prime, when you have multiple AIMO devices connected. 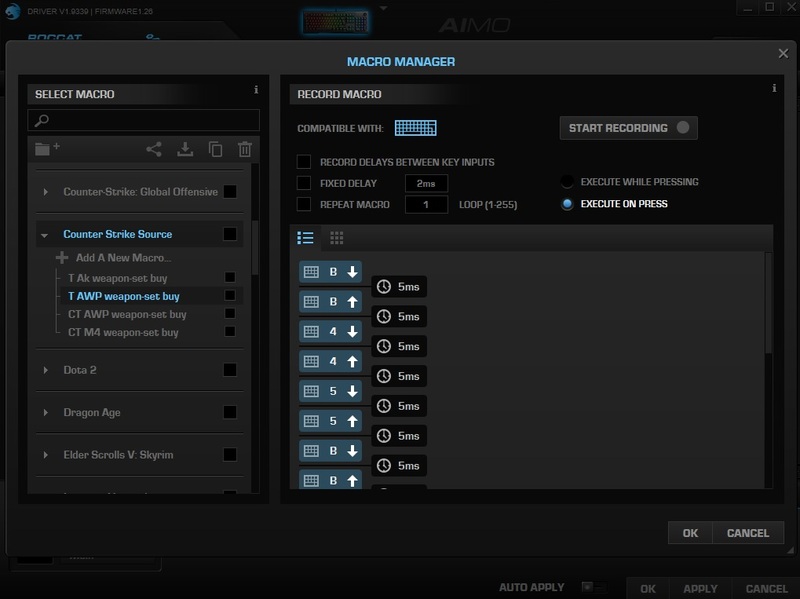 Therefore, when I activated the AIMO function, having the Vulcan 120 AIMO as the only AIMO device connected, I could not tell what I was supposed to be experiencing. I was just greeted with a highly active and colorful lightshow, without much explanation as to what AIMO was supposed to be doing for me. 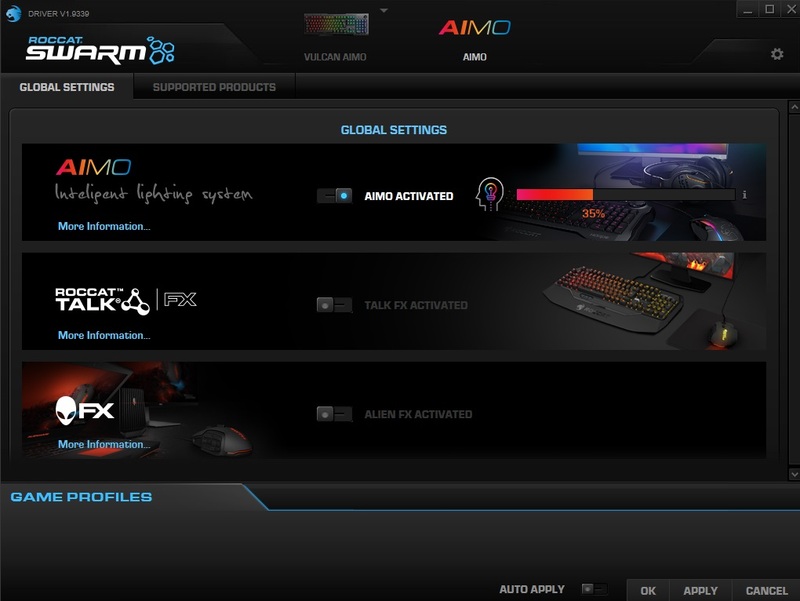 Clicking “More Information” just takes you to a generic splash page that doesn’t really explain what AIMO is really supposed to do for you other than drown your AIMO-ready peripherals in constantly changing colors. Perhaps I needed more AIMO-ready devices to appreciated the full experience or maybe there will be some updates in the future that help showcase AIMO’s benefits. For now, it was just a pretty colorful display that felt distracting much of the time. After about an hour of use in AIMO mode, I found myself turning it back off so that I can go back to enjoying my own custom settings. AIMO aside, Roccat’s Vulcan 120 AIMO is an excellent product, being right on target with its $159.99 price point. 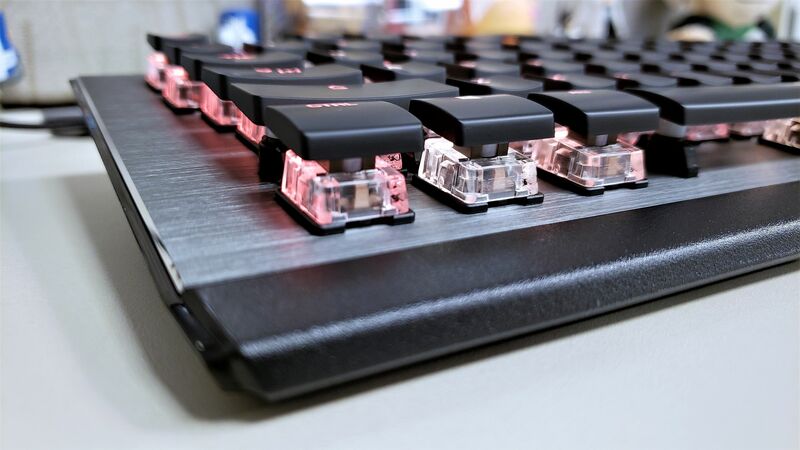 Key-presses are responsive and satisfying while being quieter than most mechanical keyboards. The top aluminum plate coupled with dust-resistant Titan switches provide the keyboard a nice level of self-sustainability. 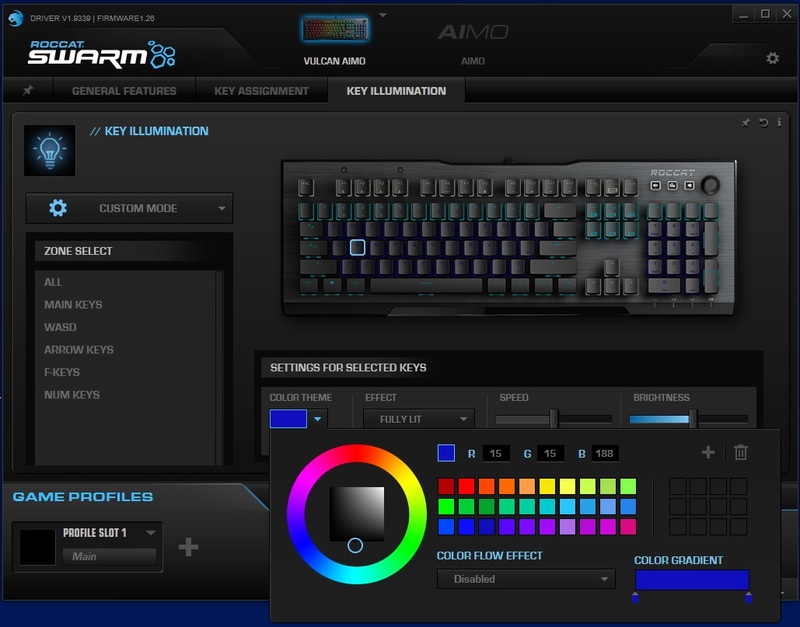 The Vulcan 120 AIMO’s key illumination is probably the best I have seen when it comes to gaming keyboard LED’s. Not to mention, the Roccat Swarm software is simple to use, opening up all of the Vulcan 120 AIMO’s functionality to you. In the end, I did not let AIMO change my overall opinion of the Vulcan 120 AIMO. I just simply did not understand what I was getting from it. Even though AIMO is in the product’s name, the Vulcan 120 AIMO is still a strong product without it. 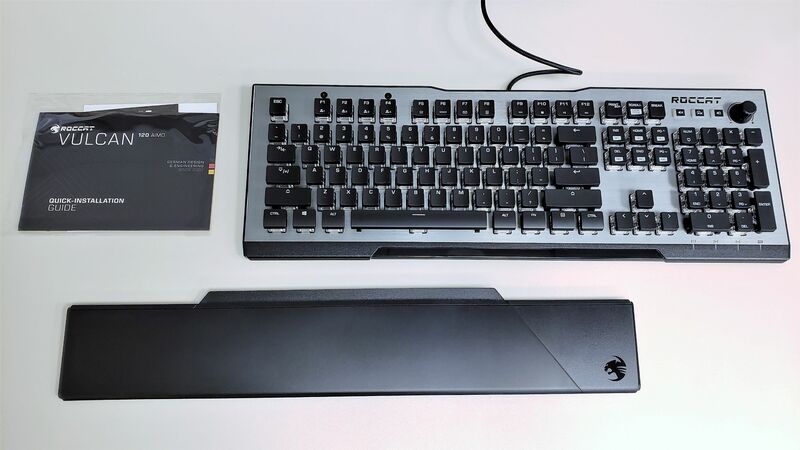 † Roccat Vulcan 120 AIMO keyboard and some stock product images provided by Roccat PR for review.